The Festival, called in Sicilian dialect “Fistinu” is a traditional historical court, in a mix of folklore and religion that culminates in fireworks. Authentic chest of traditions, the Santa Rosalia Festival, Patron Saint of Palermo is an event that attracts tens of thousands of tourists to the city. It celebrates the liberation of the city from the plague in 1624, following the discovery of the relics of Santa Rosalia on Mount Pellegrino. The first celebration took place in 1625, and over the centuries the festival has been able to reinvent itself but maintaining unchanged all its charm and tradition. In Santa Rosalia and in its feast the citizens of Palermo find a reason and occasion of collective identity well-synthesized in the screams of Viva Palermo and Santa Rosalia. So it is for sure the best occasion for you to book your holiday in Sicily, choosing among the best Villas in Palermo, and live the real authentic atmosphere of the greatest celebration in Palermo. During the night between July 14 and 15, thousands of devotees but also tourists accompany the long march of the Cart of Santa Rosalia, and will move from the Cathedral to Foro Italico, the sea side of Palermo, passing by Quattro Canti and Porta Felice, the entrance from the side sea to the Cassaro quarter. At Foro Italico a mix of folklore and religion that culminates in the traditional fireworks that illuminate all the city. Santa Rosalia or Rosalia Sinibaldi (1130-1156), according to tradition, belonged to the noble family of Sinibaldi. She went to the court of King Ruggero before retiring as a Hermit in a cave on Mount Pellegrino, where she died. 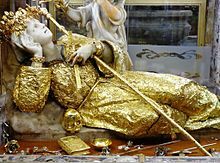 In 1624 she saved the city from the plague and became the Patron Saint, overthtrowing Santa Cristina, Santa Oliva, Santa Ninfa and Sant’Agata. According to the legend, she appeared in a dream to a hunter pointing to where he could find her remains, which led to the procession in the city would have stopped the epidemic. Celebrations for Santa Rosalia begin on July 10th and lasts for five days. During the first three days the organization prepare everything for the great procession of the day 14 of the triumphal carriage parade and that ends with the famous show of fireworks. The celebration ends on day 15 with the solemn procession of the relics of the Blessed Virgin, contained within the silvery Urna, between two crowd wings.